Sing Row, Row, Row Your Boat. If you have others with you, you can sing in a round. Today's color is navy blue. Spend some time looking through magazines or books and seeing all the things that are navy blue. What is your favorite? Talk about why this shade of blue is called navy blue. Pirates live on ships in the navy blue sea! 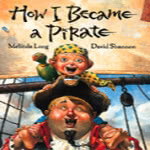 Read How I Became a Pirate by Melinda Long. Lots of great activities for learning about boats! Wonderopolis: How Do Boats Float?